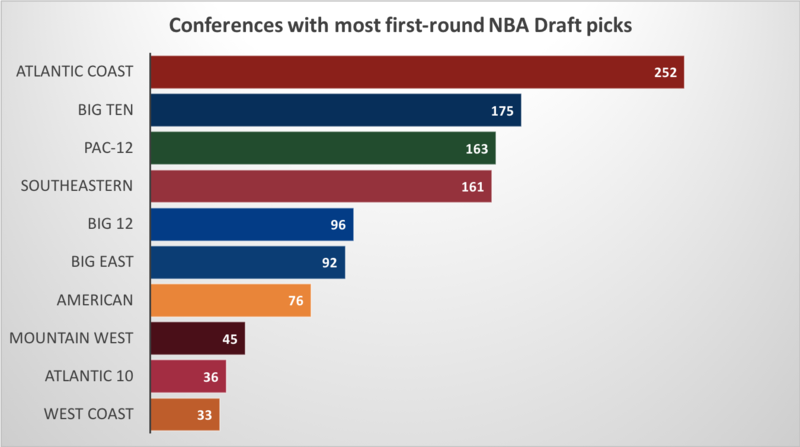 Since the NBA Draft's inception in 1947, 1,444 players have been drafted in the first round. Almost 90 percent of those players came from a Division I school. Chances are, if you picked one at random, they'd have worn blue in college. About four percent of all draftees have come by way of Chapel Hill, as North Carolina accounts for the most first-round NBA Draft picks, with 48 to their name. That’s one more than fellow blue-blood Kentucky, and six more than Tobacco Road-rival Duke. No big surprises there. The top 10 schools there account for 44 of the 80 NCAA championships alone. But they only can claim 17 of the 71 top overall picks since 1947. Since 1947, 66 top overall picks have come from NCAA Division I schools. Two have come from overseas, and three from high school. No schools have seen more No. 1 picks than Kentucky and Duke, which each have sent three. From Kentucky, those three are John Wall (2010, Washington Wizards), Anthony Davis (2012, New Orleans Pelicans), and Karl-Anthony Towns (2015, Minnesota Timberwolves). Duke’s trio is Art Heyman (1963, New York Knicks), Elton Brand (1999, Chicago Bulls), and Kyrie Irving (2011, Cleveland Cavaliers). Aside from those two, 43 schools have had at least one No. 1 pick taken, and 17 have seen two. Having North Carolina lead most overall picks, and Duke lead most No. 1 picks should clue you in to which conference reigns supreme in the NBA Draft. The Atlantic Coast Conference has had an impressive 252 players drafted in the first round, approximately 20 percent of all Division I players drafted.